Boracay Island in the Aklan Province, is located roughly in the center of Philippines. It is the most popular island beach getaway for Filipinos and International travelers alike because of its white sandy beaches with shallow cerulean waters, affordable drinks, friendly locals, and modern lodgings. High season or low season, it remains busy. The only difference are hotel prices, the crowd size on the street or the beach, the number of rain showers a day, and maybe the fruits in season. Getting the flights booked and visas (if required) is easy but what can be confusing is getting from airport to the island so we decided to create a post to help answer questions for first time travelers heading to Boracay. There are no airports on tiny Boracay island. 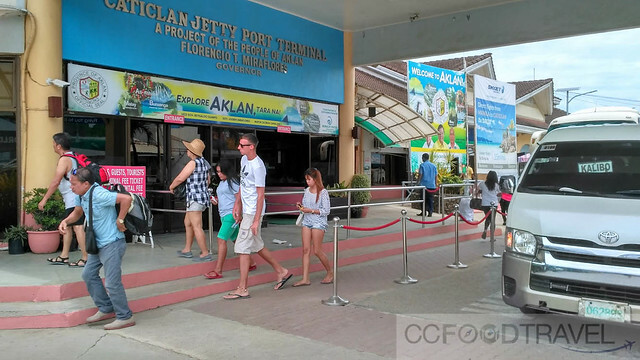 Instead travelers have a choice to land on two airports, Caticlan and Kalibo, in Panay Island and they have to find their way to Caticlan jetty. 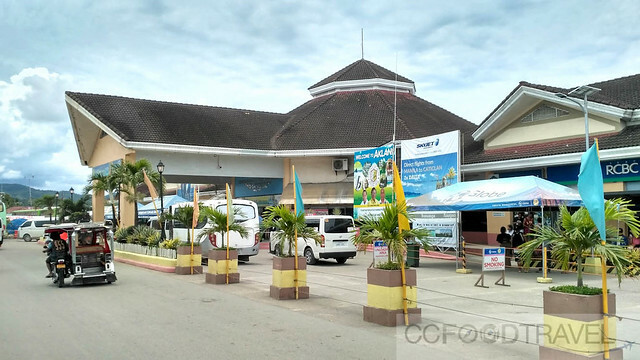 Caticlan airport (officially Godofredo P. Ramos Airport) offers quick convenience as the (Caticlan) jetty is just 600m away but flights are more expensive and only serviced by Philippine airlines. Kalibo airport located in Kalibo town is a minimum 1.5 hours drive to Caticlan jetty and caters to larger capacity planes. Now with direct flights from Kuala Lumpur to Caticlan and Kalibo with Cebu Pacific and Airasia respectively, it’s so easy for travelers coming from, or living in the ASEAN region to get to the happening island of Boracay fast. We chose Airasia as we wanted a little adventure and to save some money plus Airasia offers the best tasting food in comparison to other low cost carriers IMHO. AirAsia to Kalibo return airfare ranges anywhere between Rm500 – RM1000 depending on season of travel – affordable and our flight went on without a hitch. AirAsia arrived right on time at our destination Boracay. To those who think that traveling during off peak season is a bad idea, think again. Pristine beaches all to ourselves and the sun shone 90% of the time. Discard your misconceptions and do yourselves a favour, visit Boracay during off peak season! We arrived Kalibo airport about 2:30PM, after a 4 hour flight from KLIA2. Kalibo airport is surprisingly small in size for an airport that caters to large amount of international travelers. The facilities are basic and could do with some repairs and upgrade. 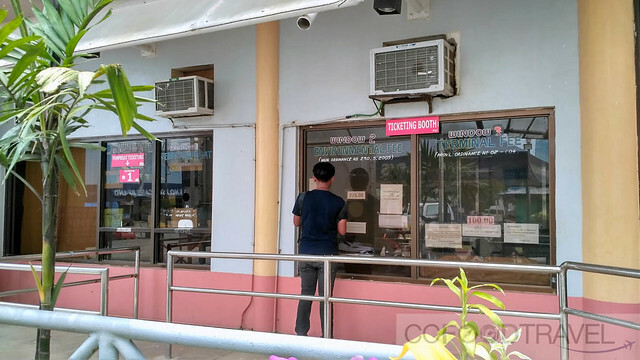 Once you exit Kalibo Airport arrival gate, there will be stalls and shops selling mobile SIM cards and transfer options to Boracay. Rates by transport companies and SIM cards are somewhat standard as we were advised by a local. Tricycles for shorter distances will require haggling. We bought a prepaid SIM card which offers unlimited data for 7 days for Php300. No voice calls. The sales person helped us to change the SIM. There are shorter and longer duration packages but we have forgotten the rates. If you skip the full service packages offered by tour companies and buy tickets independently, bus and vans options to Caticlan jetty would cost Php300 per adult. You would have to wait for travellers to fill up the seats before departing. Since the cost was Php1000 for a private taxi and we were a family of 3 with 2 large luggage and 3 backpacks, we opted for the comfort of this transfer option. The road journey takes minimum 1.5 hours journey passing by Kalibo town, villages, highlands, pretty farmlands and then coastline at the end. By bus. Book at any of the packages offered at the arrival area of the airport. It usually includes a bus ride to Caticlan Jetty and a ferry ticket. It usually costs around P300 per person. By van. Vans will take you to Caticlan in a shorter time. Sometimes, they can do it in an hour and 15 minutes. Fare is P200 per person. Via Kalibo Town Proper. You may take a tricycle to take you to Ceres Bus Station, and from there take the bus to Caticlan. Air-conditioned bus: P107; Ordinary bus: P87. The speed boat journey to Boracay’s Cagban Jetty Port takes around 15 minutes long, followed by transport ride to your resort/hotel. Our speed boat ride was provided by our resort. If your lodging does not provide boat transfers, you will have to catch the regular motorised outrigger boats which has the same journey duration except you need to wait for passengers fill up their minimum quota. There are 3 tickets you would need to purchase per person is Php25 Ticket (per way), Php75 Environmental Fee, and Php100 Terminal Fee (per way). Infants under 2 years is free. On reaching the island, you will need to arrange your transport to your lodging. Depending where you get on or off the boat, you may need enter from beach shore so we suggest to wear sandals and nothing longer than knee length clothing otherwise you’ll have to deal soggy shoes and socks until you reach your lodging which might take a while with the heavy traffic on the island. On the last day of our trip, we had to find our own way, from Station 1, to Kalibo Airport. With a child in tow, we opted for a door to door package where we were picked up from the lodging and brought directly to the airport. Southwest Tours, Island Star Express and 7107 Island Tours offers this door to door transfer service. We chose Southwest out of convenience as we found the office on Boracay. The pricing was just a little more higher than if we were going to find our way independently to the jetty, buying tickets, and then finding our transport to the airport. It solves the inconvenience of hailing and haggling with a tricycle, figuring out the ticket counters, boats, lugging several bags, and dealing with a 1 year old’s tantrums. We also saved when we found out there is no ferry charges for child below 2 years old and no charge for the door to door service. The total price, from door to door was Php 1800 for 2 adults. Children below 2 years – free. 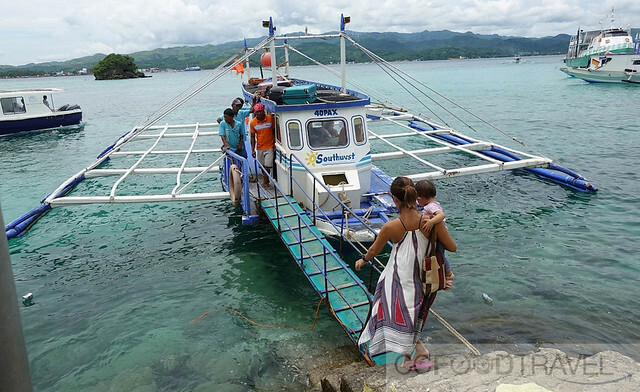 Php500 – van to Cagban Jetty, PhP200 – terminal fee, Php1100 – private taxi from Caticlan to Kalibo airport. We chose a private taxi over a join-in airport bus (which is cheaper: Adult Php200, Child Php120) so we can start and stop at our convenience for the sake of our child. Our flight was at 3PM and we were picked up about 10AM by the scheduled transfer for the jetty. Getting from Caticlan is a simple affair. Upon exiting the airport, you can walk over to the jetty if you are traveling light, take a tricycle (Php50) or taxi. At the jetty, its the same procedure as stated above to get over to Boracay. All in all it is a long trip, getting to the Hotel on Station 1 (around 8 hours in total including flights) but our family of 3 managed to do it without much complications. Even with a 1 year old in tow. More on our resort of choice in Boracay, after this post! I had a great time in the Philippines last year, but sadly, didn’t reach the Boracay Islands. As a professional mother with a child; albeit a teenager, whenever we travel to Asia or Eastern Europe as a family, we opt for a taxi to pick us up from the airport or train station, as sometimes the price is so cheap and convenient, you wonder how people don’t do the same! We went to Estonia (Eastern Europe) two years ago, and the taxi fare was €3.00! In Croatia, the taxi fare was cheaper than 2 glasses of wine and a cola! And Croatia is very cheap. I even left the meter running! In Manila, I used Grab taxi, and sometimes the fare was between just Php 40 – 100! In Manila! Glad you liked the post Victoria! We have yet to visit Manila. So far it’s just been a transit point:) We definitely need to visit Croatia. it’s on our list! Really valuable information, I love to visit the Philippines.Thanks a lot for sharing this article. Really awesome article, Keep it up. I remember leaving the house at the crack of dawn and finally settling down in the hotel room as the sun was setting! But we did have fun in Boracay!